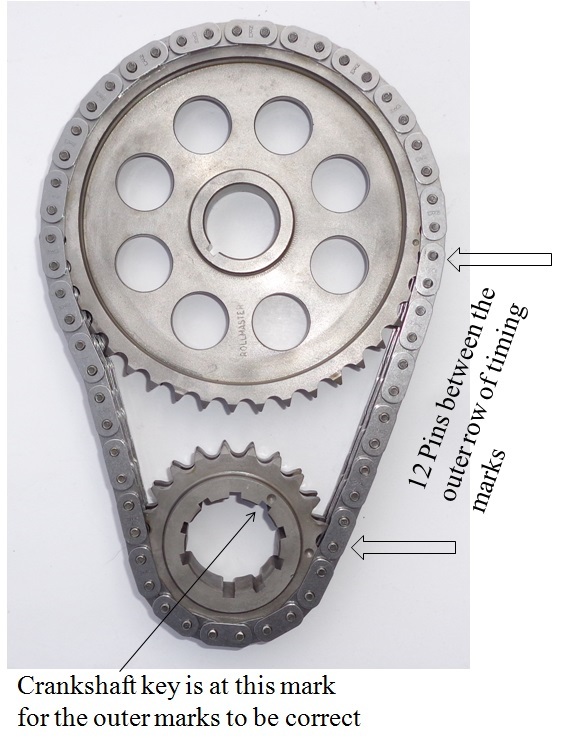 Most camshaft timing sets for the Ford Y family of engines (239/256/272/292/312) requires that there be twelve pins between the timing marks on the sprockets and for those marks to be on the oil filter side of the engine when doing the initial chain installation. 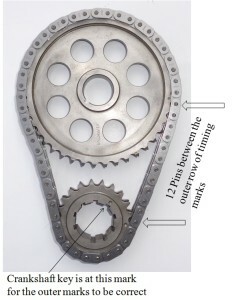 The exception here is that this only applies to Y engines that actually use a timing chain and does not apply to right hand or reverse rotation marine engines that use a gear to gear setup. 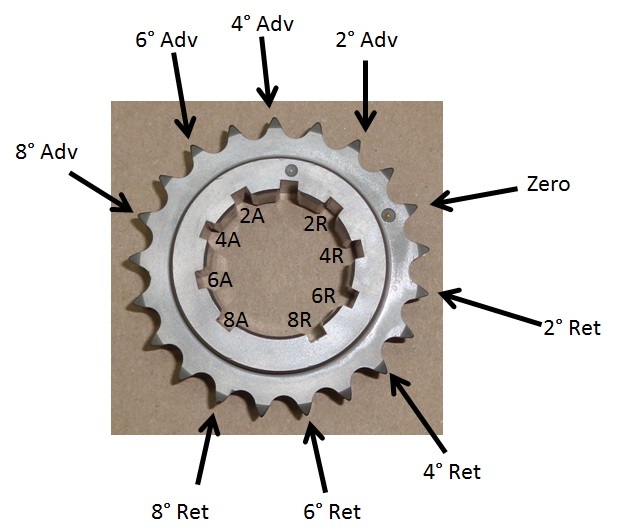 While the Y is not the only engine to use the pin or link count between gear marks to time the camshaft, most V8 engine families simply align the timing marks on the cam gear and crank gear with the centerline of the engine. Due to the infrequency of engine manufacturers using the pin or link count for camshaft timing, it does leave the door open for mishaps by those not familiar with this. There have been too many instances recorded where Ford Y engines have been assembled with the cam and crank gear timing marks aligned with each other rather than counting the pins between the marks. Even some very reputable shops have been blindsided by this. Unfortunately many of these incorrectly installed timing sets were not discovered until the engine was installed in the vehicle. In these cases, the engine simply spins over quite easily without any compression and obviously doesn’t fire up. Once the problem is isolated to ‘cam timing’ (which usually takes awhile), it’s an ordeal to either fix this in the vehicle or actually pull the engine back out and return the engine to the shop that did the work. While it is an embarrassment for anyone that does this, it’s easily prevented by knowing one basic cam design nuance. For most V8 engines and with the #1 piston sitting at or close to TDC, either the #1 or #6 cylinder intake and exhaust tappets will be caught at the overlap cycle. (An exception to this rule would be the Nailhead Buick V8’s which would be cylinders #1 and #4 being at TDC simultaneously.) This is where both lifters on the same cylinder are in the process of moving but will be approximately level with each other when the timing set is correctly installed. The exhaust tappet will be going down (almost closed) while the intake tappet will be moving up (just opening); both will be approximately the same distance off of the heel of the camshaft. This also applies to the Ford Y with the following additional detail. With the timing set installed with the twelve pins between marks on the oil filter side of the engine and the #1 piston at or close to TDC, it will be the #1 cylinder intake and exhaust tappets being close to level with each other although both are in the process of moving. This is simply a good double check for anyone installing a camshaft in a Y engine without going to the trouble of actually degreeing it in. For those of you that are going to that next level and degreeing in the camshaft, this lets you know that the cam is in the right neighborhood before actually getting some real numbers on where it’s really residing. While the Rollmaster roller timing set for the Ford Y-Block family of engines comes in a variety of flavors, they all share a crankshaft gear that has nine different key slots in which to install on the crankshaft. 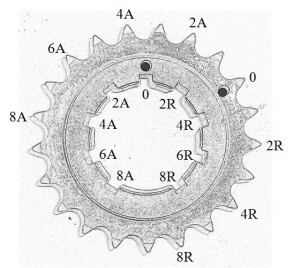 Only one of those key slots and a corresponding outer tooth is marked though. 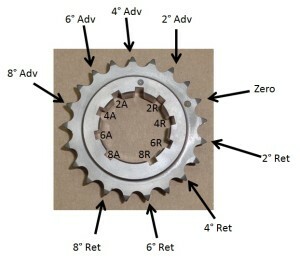 There are eight other key slots on the crank gear that are unmarked and this can become a mind teaser when the camshaft needs to be either advanced or retarded beyond that zero marked position. 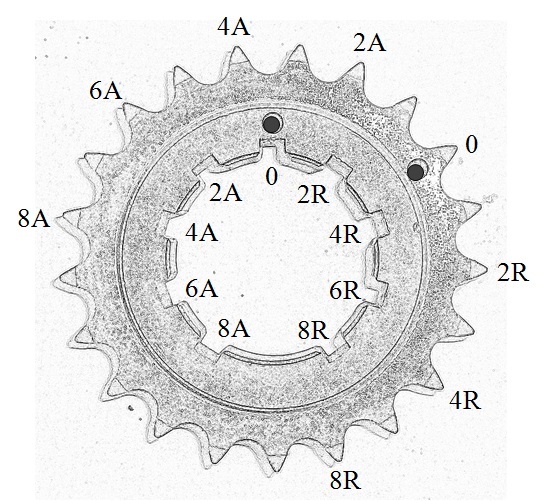 To simplify moving the crankshaft gear to another position, here are some illustrations to facilitate advancing or retarding the camshaft a given number of degrees. Until next issue, happy Y motoring. Ted Eaton.